Familial hypercholesterolaemia (FH) is a genetic disorder of cholesterol metabolism caused by mutations in LDL receptor (LDL-R) gene. These result in high blood levels of LDL cholesterol (LDL-C), accelerated atherosclerosis, premature heart attack and sudden coronary death (with age-standardised mortality increased 80-fold in those <50y). 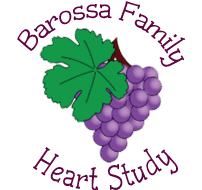 We have recently identified the FH Morocco LDL receptor mutation (c.682 G>T, p.Glu228Term) in Barossa valley residents with FH. This mutation is likely to have been brought to the Barossa Valley from Silesian ancestors in the 1850s, as it is a common mutation in Silesia (now Eastern Germany, Western Poland and Northern Czechoslovakia). (1). Initially (2012): Using microsatellite analysis, to investigate the epidemiology, modern geographic distribution and Neolithic origins of FH Morocco. and the existence of a founder effect for FH Morocco in the Barossa Valley as the result of genetic isolation, in which the gene frequency of FH Morocco may be increased to ~1:80 compared with 1:500, the usual frequency in Silesia. (2). Subsequently (2012-2013): to investigate the nature of other LDL-R mutations in Barossa Valley residents. A large number of mutations (>100) are expected, some likely to be novel and possibly having arisen de novo. (3). In the longer term (2013-2015): to carry out a pilot FH cascade family screening (CFS) programme specifically designed for general practice, based on the recently-published WA model of care (MoC). CFS is the most cost-effective means to identify affected relatives of an index case. Early identification of FH allows early and effective treatment with statins to lower LDL-C levels, thereby improving life expectancy and reducing the burden of cardiovascular disease. The usefulness and potential applicability of the GP- BFHS MoC to other centres in Australia will be investigated though cost-effective and other analyses. Principal co-investigators: Prof. Ian Hamilton-Craig, Griffith University, Southport, Queensland (ihcgriffith@gmail.com) and Prof Frank van Bockxmeer, University of Western Australia, Perth, WA (Frank.VanBockxmeer@health.wa.gov.au).